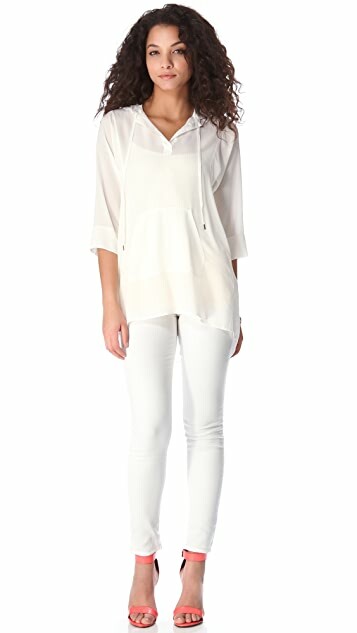 Rebecca Taylor puts an elegant spin on a casual silhouette. 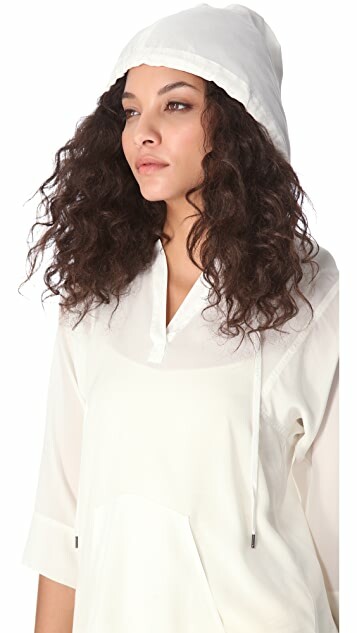 This oversized, hooded pullover is cut from shimmering silk crepe and classically detailed with a drawstring neckline and a pouch pocket. Semi-sheer. When I received this Hoodie, it exceeded my expectations. I took a gamble on the size and was afraid that it might be too long for my height. I am 5'3" and 130lb curvy which typically puts me at a size 6. Looking at the model, it seems big on her at the shoulder and arm pits so I ordered the 4 thinking this fits large and it fits perfectly. It drapes nicely and the crepe silk is very beautiful. It is tissue sheer so I wore it with leggings and a long tank. I think it might look nice with skinnies too. The length is a bit longer on me than the model but it works. I got the mint colour and love it, not too minty, very subtle, looks great. I like how casual this hoodie is but how chic it looks on because of the simple lines and great quality. Great attention to detail on the craftsmanship. I would size down one if you are curvy and even two if you are more athletic shaped. 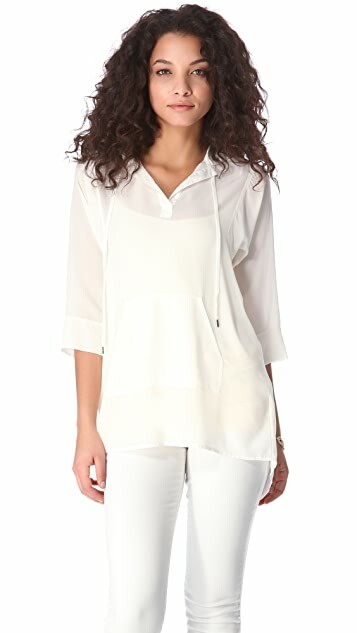 This blouse isn't for me. I didn't like the color - it isn't pure white but not ivory either. It looks like it's been to a dry cleaner a lot and lost its original whiteness... The style seems comfy but when I put it on, it just hangs off my shoulders and doesn't look special. Maybe because my shoulder aren't broad enough to support this style. It could work better on a different body type, I'm guessing. I liked the hoodie idea and the fabric stretches nicely but Im not keeping it. Quality and hoodie ideas are good and hence three stars.